Casino Cruise offers attractive bonuses to new and existing players, including freespins and deposit bonuses. New players can enjoy $1000 in welcome bonus, as well as 100 freespins, when they make their first deposit. 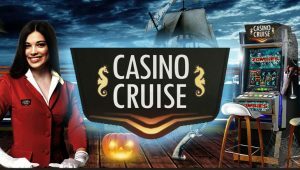 Additionally, Casino Cruise has started promoting lots of deposit-free bonuses which makes it possible for you to play even more before you make that first stake. The most active gamblers may gain a lot from signing up to the special VIP program. VIP members enjoy many additional benefits, such as extra points in the regular loyalty program, extended customer support, weekend promotions- and of course, lots of gifts and bonuses. The VIP program is by invitation only, so once you have spent enough in deposits and played for a while, the VIP team will get in touch with you to issue a personal invitation. The Captain’s Club, as the VIP program is named, has three levels; Deluxe Suite, President Suite, and Royal Suite. In the latter, which is the highest level, players enjoy a personal manager at their disposal, overlooking their account and answering any question that you might have. Casino Cruise offers gaming software from giants such as NetEnt, Playn’ Go and Micro Gaming. The variety of games is huge with more than 600 different titles. The website is user-friendly, and it’s easy to sign up for the first time. There are always new games being added, and they are featured so that they’re easy to spot. You can also use the search function to navigate between different games. Casino players can choose between a number of languages: English, Finnish, German, Norwegian, Swedish and Russian. It is easy to deposit and withdraw money in the financial functions section of the site. A wide range of currencies are supported: ARS, AUD, BGN, BRL, CAD, CHF, CZK, DKK, EUR, GBP, HKD, HUF, INR, ISK, JPY, MXN, MYR, NOK, NZD, PLN, RMB, RON, SEK, SGD, THB, TWD, USD, ZAR. The minimum amount of deposit is $10, while the maximum daily withdrawal amount is set to $100 000. Pay-outs usually have a 24 hour window period before it is wired to your account or reflected back on your credit card. This is due to security reasons, as they want to make sure that all your documents are submitted and no legal actions are taken against you. Make sure that you have submitted all the required documents before you start playing, if you want to avoid the waiting time. As any other respected casino, Casino Cruise now offers a mobile platform for players on the go. They have got hundreds of titles, ranging from slots and table games to video poker and others. The mobile version is supported by all the main smart phone platforms such as Android, iOS and Windows. The support team is always ready to help you at Casino Cruise, and can be reached by chat, e-mail or phone. If you don’t have the time to sit and wait for the team to pick up your call, they offer a pretty handy call-back service. Just enter your number, and a customer representative will get back to you as soon as possible. Customer service at Casino Cruise is open 24/7, which is more than most online casinos offer. However, some players complain that this is only for phone service or e-mail function, and not for the live chat. The staff is located in multiple locations, hence international dial charges may apply. For a detailed overview on phone numbers and service languages, it is advised to have a look on their website.